Mr Brian Molefe is the Group Chief Executive of Transnet SOC Ltd, the state-owned freight transport and logistics company responsible for South Africa’s rail freight, ports and pipelines network. He was appointed to the position in February 2011 following a successful stint as the Chief Executive of the Public Investment Corporation (PIC). At the PIC, he led an unmatched growth in assets under management from R308 billion to just under R1 trillion between 2002 and 2010. Molefe is leading Transnet through its record-breaking infrastructure spend programme, the Market Demand Strategy, a R307 billion seven-year investment programme. Molefe has a Master of Business Leadership and B.Com degree from Unisa, as well as a Post Graduate Diploma in Economics from the University of London. He has also completed the Advanced Management Programme at Harvard Business School, the Programme for Young Global Leaders at the Kennedy School of Government Harvard University, as well as the Executive Programme, from Wharton Business School. Before joining the PIC, he was Deputy Director General at the National Treasury, where he was responsible for Asset Liability Management. 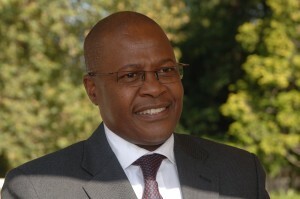 Molefe has received several awards in recognition of his contribution to the economy, particularly his role in the advancement of black economic empowerment. These include being chosen Chief Executive Officer of the Decade by the Association of Black Securities and Investment Professionals (Absip), 2012 – 2013. Mr Molefe was named Africa’s “Business Leader of the Year” by Africa Investor in Tokyo, Japan while CNBC Africa honoured him with the Business Success in Africa award. As a state-owned company (SOC), Transnet is wholly owned by the government of the Republic of South Africa (RSA), under the auspices of the Department of Public Enterprises (DPE) as its shareholder. Transnet is structured to provide freight and logistics services through its five operating divisions, namely, Transnet Freight Rail (TFR), Transnet Engineering (TE), Transnet National Ports Authority (TNPA), Transnet Port Terminals (TPT) and Transnet Pipelines (TPL). The company is the custodian of freight rail, ports and pipelines and is responsible for enabling the competitiveness, growth and development of the South African economy through the delivery of reliable freight transport and the handling of services that satisfy customer demand. Overall, Transnet’s mandate is to lower the cost of doing business in South Africa – efficiently – and within acceptable benchmarks. The company is currently pursuing its R300 billion Market Demand Strategy (MDS), which will significantly boost infrastructure development, job creation and investment in South Africa, and expose the country to a host of international trading possibilities. Transnet’s vision and mission is to be a focused freight transport company, delivering integrated, efficient, safe, reliable and cost-effective services to promote economic growth in South Africa.The company’s aim is to achieve this goal by increasing the market share, improving productivity and profitability and by providing appropriate capacity to customers ahead of demand. The company also has the following special units: Transnet Property which is responsible for all the company’s properties, Transnet Foundation the custodian of Transnet’s Corporate Social Investment and Transnet Capital Projects which focuses on the development of infrastructure as well as planning and executing big projects on behalf of the Operating Divisions.